This year appears to tie 2007 for the seventh-lowest ice extent on record. 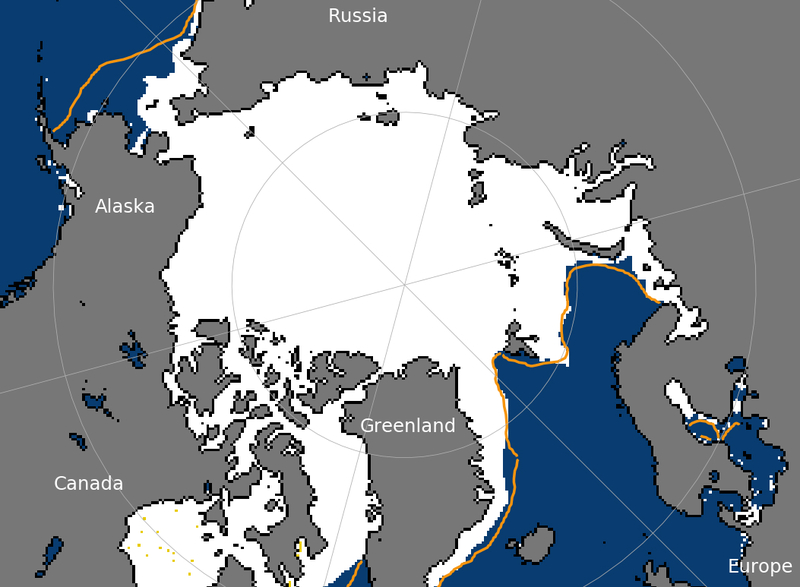 The sea ice melt season is underway in the Arctic. Sea ice likely reached its winter maximum on March 13, the National Snow and Ice Data Center reported. The freeze extent reached 14.78 million square kilometers (5.71 million square miles), about 5.5 percent lower than the 1981-2010 average maximum extent, the Colorado-based center said. Ice extent is defined as the area where there is at least 15 percent ice coverage. Though not close to a record-low maximum reached in March of 2017, this year’s freeze does fit with a pattern of lower winter freeze extent. This year’s maximum tied with 2007 as the seventh lowest in the satellite record, and the four lowest winter maximums documented by the NSIDC occurred in the years from 2015 to 2018. The declaration of a winter maximum is tentative, the NSIDC said. A more complete analysis of the winter freeze-up is planned for early April. In the Bering Strait region, where there was extraordinary warmth and lack of freeze, there was a late-winter spurt in ice growth. New ice has formed in the northern Bering Sea and southern Chukchi Sea, areas that were open after a midwinter meltdown. Though still short of the annual maximums hit in mid-January, ice area and ice extent in the Bering Sea have returned to late-February levels. Don’t expect that ice to last for long, advised Rick Thoman of the Alaska Center for Climate Assessment and Policy. Almost all of it is less than three weeks old, and it’s ultra-thin, “just skim ice” that refroze when weather cooled to what would be considered normal temperatures for this time of year, he said. “When the storms return next week, this is going to be obliterated,” he said. The precarious state of the ice has been cause for some nervousness in Nome, Alaska’s largest Bering Strait-area city. After mushers in the Iditarod Trail Sled Dog Race skirted around open waters, locals in the area managed to use the ice for an annual 200-mile Nome-to-Golovin snowmobile race on March 10. But in the late afternoon after the race concluded, the ice broke off the coast, according to a report in the Sea Ice for Walrus Outlook managed by the Arctic Research Consortium of the United States. Some crab fishermen lost the pots they had set when the ice broke apart so abruptly, according to the report. What ice exists is generally not safe for travel, Thoman said. “Yes, there is ice, but it’s not what it should be this time of year,” he said. 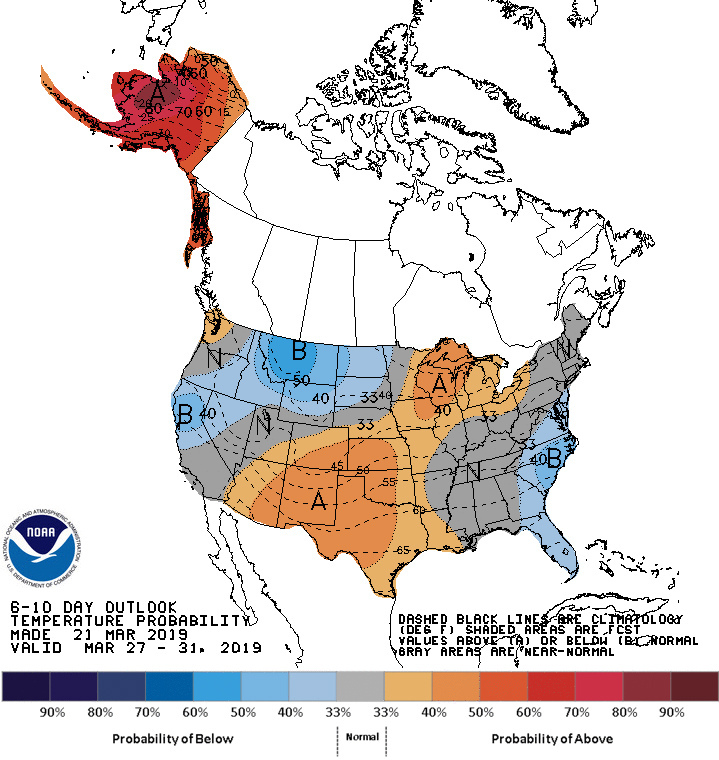 Extremely warm temperatures are expected in the Bering Strait region for the next six to 10 days, according to the National Weather Service’s Climate Prediction Center.